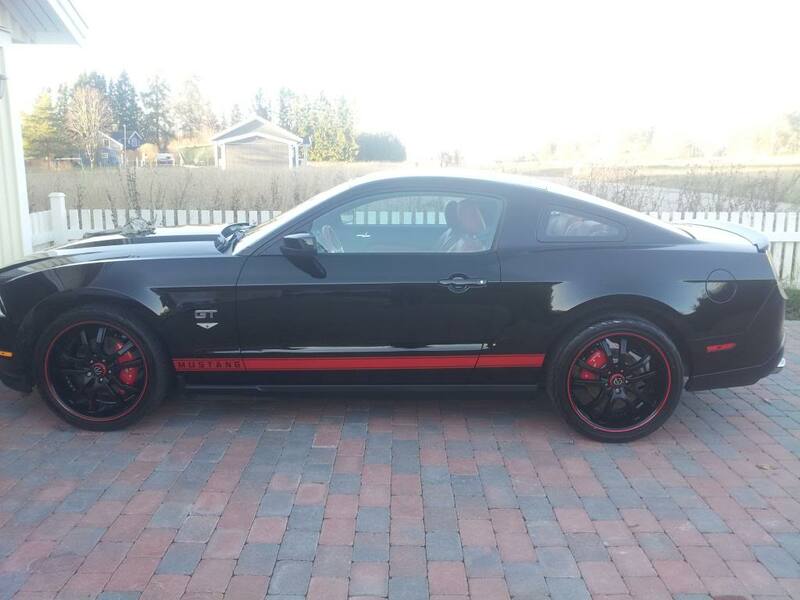 Wheel options for a black 2012 Mustang? I'm looking for some solid wheel options for a black car. I usually just throw Anthracite / Gunmetal tuner style wheels on and call it a day, but I am not sure how well this would work on a black car. I'm open to being convinced to do this and I'm also open to being convinced of other options. I'm thinking maybe it's time to get some silver wheels instead? I do plan on a full suspension as well as front and rear lip. I'm honestly kind of disappointed in the offerings and color options on a lot of the major websites I've found. I tend towards 5 spoke machined, maybe even machined with black, gunmetal, silver... depends on the amount of color. I kind of liked the chrome and got a GREAT deal on them but I feel a change coming on. My first set was a silver/polished deep dish, there's some pics in my garage. Good luck and take your time, wheels have got to be one of the biggest decisions! How about black wheels with red accents? I've seen these and I think they look awesome. Hyper silver always looks **** on black. Quick Reply: Wheel options for a black 2012 Mustang?